Cut lettuce into pieces, wash and drain well. Make sure it has as little water left over as possible to make the dressing stick better. Cut chicken into dices and marinate with a spoon of oil, a pinch of salt and pepper, some red paprika, turmeric and thyme. Heat a pan to medium, add chicken and cook until golden brown and crispy. Remove from pan and set aside to cool. Cut bread into dices, drizzle with some olive oil and bake until crispy, either in an oven or in a pan on the stove. Prepare the salad dressing: in a container, place mustard, lemon juice, garlic, vegan mayonnaise, soy sauce, season with salt and pepper. Add olive oil, sunflower oil and grated Parmesan. Whisk until well combined. 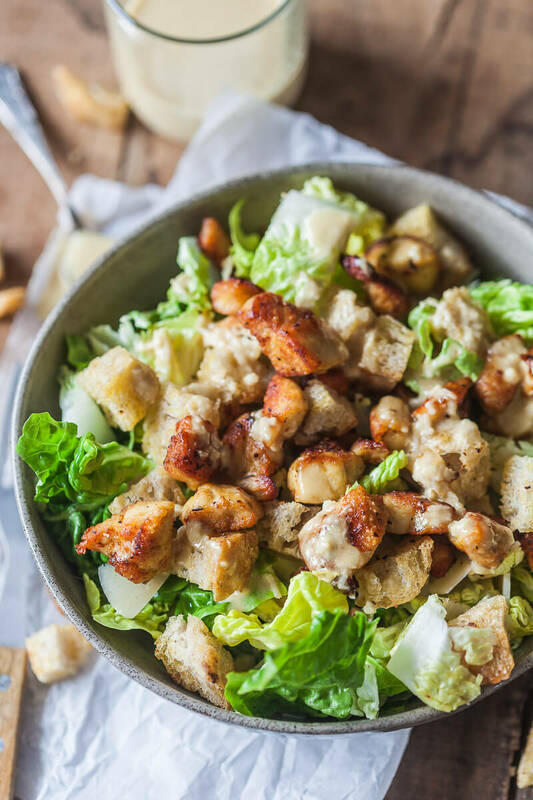 Place lettuce in a bowl, add chicken, bread croutons, some Parmesan shavings, toasted pine nuts and coat with the dressing until well combined. Serve.